I don't have a PayPal account. Can I just use a credit or debit card, without a PayPal account? My payments failed and access to the software has been suspended. How do I start making payments again? Has the software been approved and certified by Betfair? Does Cymatic see or log my Betfair username or password? I forgot or lost my activation code. Can I reuse my activation code, for example if I change computers and want to install the software again? I have replaced my computer with a new one. How do I re-install the software and re-use my license on the new computer? Which versions of Windows are compatible? Can I install the software on Linux? Can I use the software with more than one Betfair account? Is there a training mode so that I can practise using the software without risking real money? How do I green up or cash-out? Can I view multiple markets simultaneously? Why do I keep seeing warning messages about it being slow? Why are prices and bets so slow? Yes there is a 14 day FREE trial. It is only available to new users. Only one free trial is allowed per Betfair username. How do I start a subscription after my free trial ends? When you login to the software after your free trial ends (or after your subscription expires), you will automatically be taken to the payments web page in order to choose a subscription option. After choosing a subscription option, you will be taken to PayPal who process all payments. You can pay by card without having to register for a PayPal account, if you prefer. IMPORTANT - you must login to the Cymatic software in order to buy a subscription. You cannot buy a subscription from the website without logging into the software first. We do not currently accept payments by any other methods such as Skrill or Neteller. However if you have a Neteller Mastercard you can add it as a source of funds in a PayPal account and then use the PayPal account to subscribe to Cymatic. To unlock the account, it is necessary to cancel the suspended payment profile in PayPal. 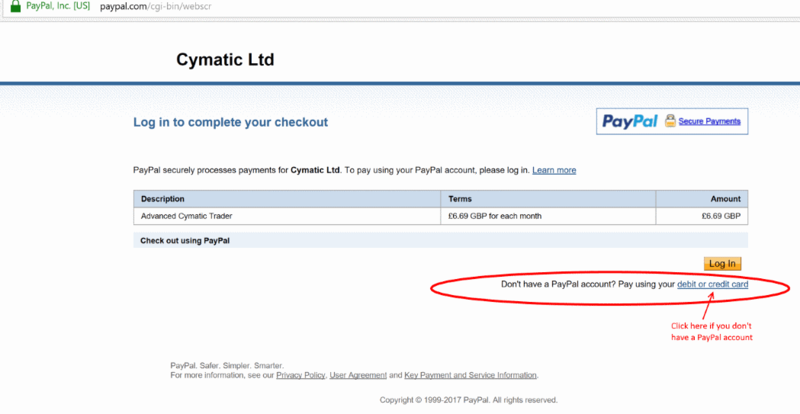 You can either login to PayPal and cancel it yourself, or contact Cymatic asking us to do it for you. If you don't have a PayPal account and have been paying by credit or debit card, then please contact Cymatic asking us to cancel the suspended payment profile for you. Once it has been cancelled, you can open the software, login with your Betfair credentials and then be automatically redirected to the Cymatic subscription payment web page, where you will be able to start making new payments again. You may cancel at any time to immediately stop all future payments. No refunds are given for any unexpired partial period already paid for. To cancel, simply visit your PayPal account and cancel the recurring payments. There is no need to contact Cymatic. If you don't have a PayPal account (i.e. you are paying by credit or debit card, without ever registering for PayPal) and you want to cancel your subscription, then please contact Cymatic (or PayPal) asking for the recurring payments to be cancelled for you. Has the software been approved by Betfair? Yes the software has been tested and certified by Betfair themselves. Betfair tests the software to ensure that it complies with certain rules stipulated by Betfair (including rules on security, product design and provisioning). In addition to the Betfair certification rules, we also adhere to the UK Gambling Commission's published requirements for ‘Remote Gambling and Software Technical Standards’. No definitely not. We never see or log your Betfair username or password. The software has been tested and certified by Betfair, who set rigid security and privacy criteria, which includes a rule that a software vendor never sees or logs your username/password, nor are they stored on your PC. The software connects directly to Betfair for login. We use the newest version of the Betfair provisioning system which is based on an anonymous access token system, so that your username is never revealed to us - this is now a Betfair requirement for all software vendors. You can instantly obtain a copy of your activation code. Please ensure that you copy and paste the activation code from the email message into the question box in the application (the question pops up when you run the software for the first time). This will ensure that you enter the code accurately. If you have entered the code incorrectly then you will see an error message saying "Activation_Code_Not_Found". Please contact us by email if you have any difficuties. Yes. The code is not locked after it used, so it can be easily re-used. You can install the software on multiple computers, using the same activation code. The code is not locked after it is used. Open the software on the new computer, it will ask you to input your activation code. You can re-use your existing activation code. If you have forgotten your activation code, you can instantly obtain a copy of your activation code here. The software will automatically recognise you when you use input the activation code and login with your existing Betfair account, so your license will continue working as normal now on the new computer. Your recurring subscription payments will continue to work automatically as normal. Yes. You can install the software on multiple computers, using the same activation code. The code is not locked after it is used. If you intend to run multiple instances of the software simultaneously, then please be aware that Betfair prefer you not to request data from any single markets more than 5 times per second (if using polling rather than streaming). Requires a purchased copy of Windows? There are tutorials at the Apple Store explaining how to use Boot Camp. Boot Camp enables you to install Windows on your Mac in a separate partition on the hard disk, so that when you turn your computer on you will be able to choose either Mac OS or Windows. Parallels and VM-Ware are vitualization environments, that enable you to run both Mac OS and Windows at the same time in different parts of the screen. Wine is an open source project that does not require Windows to be installed on your Mac! Instead it works by emulating the Windows API so that the software can run on a Mac or Linux computer. Cymatic might consider creating a native Mac version in the future, but there is no imminent plan to do so. Can I use the software on Linux? Yes, you run it inside a Windows Virtual Machine or using Wine. Users have reported that it works perfectly. There is a section in the Cymatic forum all about installing the software using Wine, with helpful instructions in this post kindly provided by a knowledgeable user. Can I use the software with more than one Betfair account, on the same computer? Register again on the Cymatic website using a different email address (like a new customer). This will provide you with another Cymatic activation code that you will be able to use to activate another Betfair account to work with Cymatic software (during step 3 below). This also starts a free trial period to be used with the additional Betfair account, after which an additional paid subscription would be requested. Open the software and login with your old Betfair account (the first one you ever used with Cymatic)*. If it asks you to activate the software then do this with the first activation code that you ever received from Cymatic, this will also give permission to the first Betfair account to use Cymatic software. Go into help menu and activate Cymatic again using 2nd activation code and email address. Go into the File menu and choose Logout, but keep software open don't close it. Go into the File menu again and choose Login, using new Betfair account, which will now be associated with 2nd Cymatic activation code and then activated on Betfair. * If your first Betfair account is closed, then don't login at step 2, cancel the login screen and go to step 3. You can repeat steps 1-5 for multiple Betfair accounts. The above procedure only needs to be done once for each additional Betfair account. Afterwards, you will be able to use the software normally and simply login with any of the accounts that you activated (subject to having an additional unexpired paid Cymatic subscription for each one as described above). Please follow steps 1-5 shown above (multiple Betfair accounts) but don't login at step 2, cancel the login screen and go to step 3. Yes. You can choose either training mode or real mode when you login. In training mode you will not risk real money, so you can practise using the software features and test your strategies. Training mode attempts to realistically simulate the queueing and matching of bets, but it obviously can't teach you how a real market responds to your bets. When you are confident enough to use real mode, you can even make bets with a stake as little as £0.01 / €0.01, so you can risk very small amounts, whilst you learn the feel of the real market, not just a simulation. Please be aware that Betfair might expect you to eventually start making real bets, otherwise they might conclude that you are commercially using their price data (which would require a commercial data license). Green up is the same as using the cash-out feature on the Betfair website. You can green up each runner, either on the ladder or the exchange view grid. In the online user manual you will see a picture of the ladder, the picture shows a number with a green background. When you are using the ladder click that number to green up. There is a similar green area in the Exchange grid view, near the middle of each row. There is also a column entitled 'GreenTo' which enables you to work a greening bet at your chosen price. There is a small green box on each row, showing the green profit available. Click it to Green up / cash-out. There is also a large green button at the top of the grid view which will cancel all bets on the current market and green up all outcomes. Yes. The user manual contains full instructions for how to use multiple markets simulataneously. You should adjust your settings as described in the user guide and in the tutorial on the forum.